If you look, really look, and see the lines and shapes that things are made of, you can draw anything. If you can write numbers and the letters A-Z, you can draw anything. With lots of examples, step-by-step guidance, helpful tips, jokes, stories and flip pictures, Kim Gamble shows: How to draw animals, faces, bodies, people in action, buildings, machines ... anything! How to give your pictures depth, using perspective. How to give them form, using light and shade. How to look, see, draw, explore and have fun! The publisher advises it for kids aged 8-12. I would think most children under 9 might need a caring adult to explain some of the text, but the voice is perfect for that age group. I really like the way Gamble has provided substance in this book, without making it at all dry. Yes, kids will learn about perspective, and the different kinds of shading. But there are also paper puppets and flip books, as well as tips from an expert illustrator studding its pages. 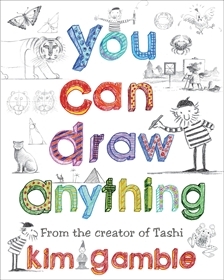 I predict You Can Draw Anything will make a popular addition to any home, school or public library.